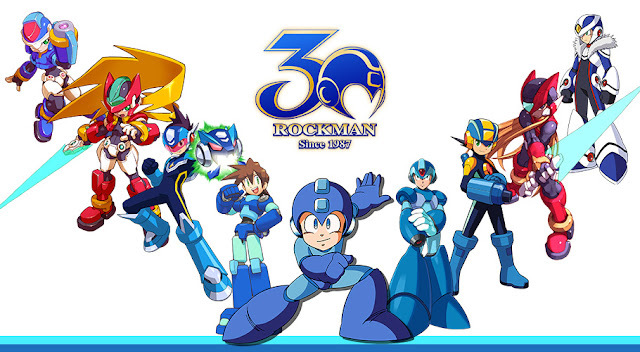 Official Rockman blog Rockman Unity is gearing up for the 30th anniversary in December. To mark the occasion, they're looking to gather comments – kudos, words of encouragement, fond memories, etc. – from fans and video game developers alike. The form is presented in Japanese but it's really not all that hard to fill out. There are three required forms to submit: the top box is your name, the second box is your comment (1,000 character limit) and the very bottom is "parent consent" for participants 16 years or under. Choose the first option. What is this for exactly? It's not entirely clear but the official website suggests your comments could result in a "new Rockman 30th anniversary project". Hmm... we shall see! Megaman has always been my most iconic childhood memories in gaming. The first game I played was Megaman 2 and beating Megaman 2 was especially epic because Ithe game had a glitch where the cavern just before the Alien Wily boss was totally messed up to the point where you couldn't see where you were going. I inadvertently used a trick some people have discovered to pass it normally, where I just fell while pressing right and kept pressing right and jumping to get through the cavern even though I couldn't see anything. This allowed me to get to Wily and defeat him (albeit, after a few tries). There are many more memories I have of Megaman games and Megaman has always held a special place in my heart and it's been sad to see the franchise so neglected, as there are very few games I care about anymore. But I hold onto the hope that one day this series will receive proper treatment again and a new generation of fans can enjoy experiences like I've had. The logo is really cool and is sweet they have X-over there, I guess he is part of the canon, somehow. Not necessarily, BN and SF aren't canon after all. I meant canon as officially recognized, they didn't sweep it under the rug like it never happen. What? They're canon, just part of a different timeline/universe. Probably because it's reused assets instead of creating something unique and fresh from scratch. They asked for feedback just so they can later say the anniversary was cancelled becaused it haven't reached the expected (and undisclosed) number of messages (like the darkstalkers Resurrection case) or say that it isn't profitable enough to go on after all the fan feedback (like the legends cancellation). And of course, there will be a lot of people sending angry messages, and with all the reasons to do it. That jab would work if DarkStalkers and Legends were actually popular and not just highly vocalized cult classics. That said they'll probably use the second excuse. I will be a little surprised if this doesn't backfire. Rockman has changed my life. He's inspired me to conquer my fears and face the hardships of my life with my head held high. I've met so many of my closest friends through the love we shared for this series growing up. As a kid i had a difficult time clearing the levels, and getting frustrated with myself, but as an adult who's played these games so many times I can clear most levels with ease. When replaying these games it's a reminder to no matter how many things change, the more they stay the same. I still can't defear Airman! "the official website suggests your comments could result in a 'new Rockman 30th anniversary project'." So, no new game then? I knew it. Thanks for letting us know in advance, Capcom so we'll be spared from further disappointment. Uh, that could still easily imply a game FOR the anniversary. I think he was implying that if a new game hypothetically depending on fan comments that it's pretty much a guarantee that nothing will come of it because it won't get enough people talking or something to that degree. I just put "Looking forward to a Rockman X renaissance!" and left it at that. Part 1: I thought I would return to say a little bit more about what Rockman means to me. My first was Rockman 2 when I was a child, but I never beat it until I was much older. Around the time I did, the soundtrack by Ogeretsu Kun (Takashi Tateishi) instantly became my favorite and remains so to this day. The power of the first Wily stage theme endures to today, inspiring songs like Okkusenman and, more recently, SOUND HOLIC's Together As One; it sounds a little cheesy, but it has such powerful energy that it inspires me and makes me feel enthusiastic about life. My second favorite, of which I've also heard a couple of great remixes, is Wood Man's stage. My third favorite would have to be the boss battle theme, which is my favorite boss theme from the Rockman games. All of the songs in Rockman 2, though, are my favorite from the Rockman series of games on the Nintendo Famicom. Rockman 7 I also love for the darker themes at the end, and for my second favorite first Wily stage theme. Part 2: Rockman X is the series I grew up with, rather than the games on the Famicom. X1 is the one I had the most trouble with, and in the end it is not my favorite of the X games, but it does things that I respect it for doing, like introducing dashing, kicking the wall to climb, and the armors; and telling the best story of any 2D action Rockman game because of the how it told the story. I felt like I was X, working my way to live up to Zero's example and defeat my rival, VAVA, and my ultimate enemy, Sigma. That feeling was accomplished with very little talking and all action in the first stage, so I loved that about X1, and I was disappointed that Irregular Hunter X changed it so you could defeat VAVA. Besides that, X1 had the best soundtrack of the Super Famicom games, though some of my favorites are actually in the sequels. For example, I didn't like X1's first stage theme for X, but I loved the first stage themes for X in X2 and X3. Zero's best themes are in X2, X4 and X5. Part 3: The first three Rockman X games are my favorites in the entire Rockman X series. X2 and X3 are my top two favorite games. X4 was really good, and X5 and X6 have parts of them that I really liked, but other parts that made playing them a chore. The music in all three were great; there is not a single Rockman game with a bad soundtrack. I am so passionate about Rockman X, it's story, and the way it plays, that it's also the series that I am most disappointed in. After the first game, X1, the story is probably the worst written of any Rockman series, but it does try to be deep and dramatic; X4 had the most potential for this, but most probably remember it for its bad voice acting or how X sounded like a girl. The most disappointing thing about the Rockman X series is X himself, and how it felt like Zero got more attention from the designers and developers working on the game, leaving X underdeveloped as both a character and as a videogame. After X3, the ideas seemed to run dry. Part 4: I really wanted to see more done with X in his own games, and done well. I understand Inafune-san and his team were excited about working on Zero, and so were everyone of us that played the X games, but now many of us who grew up with Rockman X see how the main character never realized his potential in his own games, and ended up feeling like a sidekick character. Most have probably accepted this, but even now, I see comments everywhere about how X isn't as cool or as powerful as Zero in the new Marvel vs Capcom Infinite game. He seems weaker and more uncertain than he should be, and his character development appears to be stuck in that stage. It's like X never grew up after X1, and it is sad. I want to see him not only catch up to Zero, but also become different from Rockman, and maybe even better than Zero. We don't want to see him being weak, slow and uncertain anymore. We want to see him strong, fearsome and grown-up. Part 5: Some of the cool ideas that were left abandoned or unexplored with X were the double shot from X2, the cross shot from X3, and even the stock shot from X4. Giving X two armors in X5 and X6 were terribly implemented ideas, and X8 improved on the idea, but not very well. The Falcon Armor was boring compared to what it was based off of: the flying suit from Rockman 6. The Gaea Armor was cool, but reusing graphics from the Ultimate Armor was not cool, and it would have been much better if you could punch things or create earthquakes. Having to choose between the two armors was not fun, and being able to unlock the Ultimate Armor made it a pointless choice. The Ultimate Armor was really cool at the time, but reusing it again and again since X4 was horrible and uncreative. X3 had a good idea with introducing new Ride Armors and bigger stages, but both needed more work. Some of the songs from X2 and X3 were also too repetitive, and Sigma's forms became too silly with each new game. Part 6: To say one last thing about Rockman X: everyone loves Zero because he was a well-made and fun character. The only people who hate him are the ones who think X did not get enough attention because of him, and became a less interesting and less fun character as a result. You do not have to take Zero out of Rockman X or make him less cool or popular. You only need to make Rockman X more exciting on his own, and reintroducing him like that, while also bringing back Zero, will create new excitement from old fans and new fans for Rockman X. I hope to see more care and attention paid to the Rockman X series in the future. You will also win back many old fans if you pick up where you left off with Rockman DASH 3 and release it on the Nintendo Switch, whether you work with Inafune-san or not. Most fans who wanted to play DASH 3 seem to want it on the Switch, because a game like Rockman DASH 3 would fit well on a Nintendo platform, and because the Switch is also a portable console. Part 7: I will finish my thoughts by saying that fans are excited at the thought of you finishing series like Rockman ZX, Rockman DASH, Rockman X, and the original Rockman. Most fans simply want another game to look forward to and enjoy, but others also want a conclusion to each story. I have already told you how I feel about Rockman and what I would like to see next. Thank you very much for reading, and I wish you well. Additional Comments: I miss how cool the charged shots were that X had on the Super Famicom games. Each time they changed and got better, being made of two or three different colors, and the way they were drawn and animated changed as well. This colorfulness and variation stopped when the games moved to the PlayStation, and the charged shots in general became less spectacular and satisfying. This was just one more thing I didn't like about how the X games changed; I also didn't like how X and Zero looked and felt "heavier" on the PlayStation games compared to the Super Famicom games. I am not necessarily saying you should make a Super Famicom style Rockman X9, but at least something that captures that clear style, color, and motion from the 16-bit era. Making improvements to the look of the PlayStation games, and giving X more cool moves to perform with or without shooting, would also be a good start. Part 1: I think I will tell you more in detail what Rockman means to me. When I was a child, my first was Rockman 2, but I did not hit it until I got older. When I came, Ogerec-kun's (Takashi Tateishi's) soundtrack soon became my favorite, so today as well. The power of the first Wiley stage theme continues to this day. It is an exciting song like Osenmen and recently Together As One of SOUND HOLIC. It sounds cheesy for a while but it has powerful energy that gives me inspiration and makes me feel enthusiastic about life. My second favorite, I have heard a great remix couple, but it's Woodman's stage. My third favorite would have to be Boss 'battle theme, which is my favorite boss theme from Rockman' s game. However, all songs of Rockman 2 are fond of Game of Rockman series of Nintendo Nintendo. Rockman 7 I also love the last dark theme, and the first Wiley stage theme of the second favorite. Part 2: Rockman X is not a game of NES, but a series I grew up. X1 is what I was in the most troubled and eventually I do not like my X game, but I respect the things like introducing dash, kicking walls, hanging armor. It tells the best story in every 2D action Rockman game. I felt like X. I caught up with the case of Zero and beat the rival VAVA and the ultimate enemy Sigma. I loved it about X1 because that feeling was accomplished with all the actions with little talk at the first stage. And I was disappointed to change X1 so Irregular Hunter X could beat VAVA. Besides that, although X1 had the best soundtrack in Super Famicom's game, some of my favorites are actually in the sequel. For example, I did not like the theme of the first stage of X1, but in X2 and X3 I loved the theme of the first stage. Zero's best theme is X2, X4, X5. Part 3: The first three Rockman X games are my favorites throughout the Rockman X series. X2 and X3 are my top 2 favorite games. X4 was really good, and X5 and X6 had parts I really liked, but the other part was choreographed. All three music was wonderful. Rockman's game with a bad soundtrack is not alone. I have passion about Rockman X. That is a story and the way it plays is the series I'm most disappointed with. After the first game X1, the story is probably the worst book of the Rockman series, but it becomes deep and dramatic. X4 had the greatest potential in this, but I have played with a bad voice and I thought that X sounds like a girl. The most disappointing thing about the Rockman X series is X itself, Zero attracted attention from designers and developers working on games and remained undeveloped as both characters and games. After X 3, the idea appeared to be dry. Part 4: I wanted to do better with X in my game. Mr. Inaba and his team were excited to work on zero, and everyone who played X games was, but most of us who grew up with Rockman X played games, side kicks I felt like I was. Most of them may have accepted this, but even now, in the new Marvell vs Capcom infinite game, comments on what X is neither cool nor powerful are coming out from everywhere. He seems to be much more unstable and unstable, and the development of the character seems to stay at that stage. That is sad, as X has never been raised after X1. I want to see him not only catch up to zero, but looks different from Rockman, and perhaps better than zero. We do not want to see he is weak, slow and uncertain. We want to show him strong, horrible and adult. Fukken NAILED it with that last sentence. "Gaea's armor was cool, but reusing Ultimate Armor's graphics was not col and it caused an earthquake." Part 5: Some of the cool ideas abandoned in X or undeveloped were some shots of X2 double shot, X3 cross shot, shot from X4. The armor to give two Xs with X5 and X6 was implemented severely, but X8 improved the idea, but it did not work so well. The Falcon armor was more boring than what was based on it: flight clothes from Rockman 6. Gaea's armor was cool, but reusing Ultimate Armor's graphics was not cool and it caused an earthquake. It was not fun to choose from two armor, releasing the lock of Ultimate Armor was a meaningless choice. Ultimate Armor was really cool at the time, but X4 is reluctantly reused many times because it is horribly non-creative. X3 had a good idea by introducing a new ride armor and a bigger stage, but both required more work. Some of X2 and X3 songs have repeatability, and the shape of Sigma became too stupid in each new game. Part 6: When I say the last thing about Rockman X, everyone loves zero. Because he was a well-made fun character. The only person who hates him is a person who thinks that X did not pay enough attention for him, and as a result, it became a fun character not very funny. You do not have to take Zero from Rockman X, calm him or make it unpopular. You need to make Rockman X more exciting, reintroducing him like that, restoring Zero and creating new excitement from old fans and new fans for Rockman X. The Rockman X series will be released in the future. Also, regardless of whether you are working with flounder or not, pick up where you left off at Rockman DASH 3 and release it with a Nintendo switch, you can win many old fans. Since games like Rockman DASH 3 are also suitable for the Nintendo platform, the switch is also a portable console, so most fans who wanted to play DASH 3 seem to want it on the switch. Part 7: I end my opinion, saying the fans are excited about the idea that you will complete a series like Rockman ZX, Rockman DASH, Rockman X, and the original Rockman. Most fans simply want to look forward to another game but have fun, but other fans are also asking conclusions on each story. I already talked about how I feel about Rockman, then what I want to see. Thank you so much for reading. Additional Comment: I am wondering how cool the charging shot that X had in Super Game Nintendo games. When they changed and became better, the way they were made, drawn and animated with two or three different colors changed. This colorfulness and change stopped when the game shifted to PlayStation. Generally, charged shots are less spectacular and less satisfying. This was another thing I did not like about how the X game changed. I also did not like feeling that X and Zero look "heavy" in PlayStation games compared to Super Famicom games. I do not necessarily say that I should make Super Nintendo's Rockman X9 style, but at least there are things that capture the style, color and motion of the 16 bit era. Improving the appearance of the PlayStation game and moving X more cool without taking a shot will be a good start. Yes, X not taking a shot would be a good start. When's Mega Man X9? When's Mega Man X Command Mission 2? Mega Man will always be my favourite video game franchise, and the one that helped shape me to who I am today. The original game taught me to think outside the box as I learned to destroy the Guts Blocks in Elec Man's stage with the Elec Beam instead of braving through Guts Man's stage without the Beam. I get the music stuck in my head every day and have collected everything from the main games to manga, comics, action figures, and collections. Mega Man X is my most played game of all time and I always make sure to buy it when i's released again. I'm even getting the SNES Mini partially because Mega Man X is on it! Mega Man's not just a fad; it's a legacy. Parents pass it down to their children and the series is' celebrated to this day. Capcom has a lot to be proud of with their iconic blue bomber's accomplishments, few franchises can match the history and merchandise Mega Man has spawned. Who are the 2 on the left and right? Left is Aile (MMZX), right is OVER-1 (Xover).